Microworms are not actually worms, but are nematodes, species Panagrellus Redivivus. The lifespan of the microworms are 20-30 days and the nematodes start to reproduce at three days old and bear 40 young every 1-2 days, making them a very prolific breeder. With our "Mega Culture," you'll have hundreds of thousands of these Microworm Nematodes! Treat Your Aquarium Fish to Live Food! 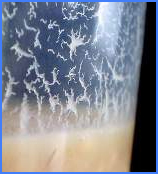 ◊ Microworm "Starter" PLUS "Mega" Culture Includes Starter Culture Above PLUS Mega Culture. Mega Culture is a 16 ounce container/lid with dry Instant Microworm Media. Just add water and mix in nematodes from the starter culture. Within days, you'll have a container TEEMING with Microworms. Instructions Included.